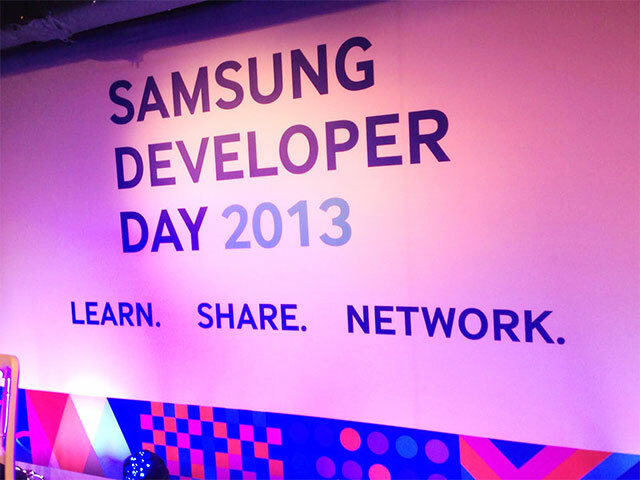 Samsung Developer Day 2013 - Learn. Share. Network. Yesterday I attended the first Samsung European Developer Day at London Film Museum, Covent Garden. The schedule was comprised of several Technical Sessions, and Commercial Sessions. Amongst the Technical Sessions, I learnt about several new Samsung technologies, and several parts of the Samsung Mobile SDK. These sessions encompassed S Pen 3.0, Smart TV and Multi-Screen APIs, Multi-user experiences with Chord and In App Purchase 2.0. I also learnt about Tizen, the new Open-Source platform, spearheaded by Intel and Samsung. As an Android Development newbie, it was great to learn some of these technologies first-hand, and speak with several representatives from Samsung in Europe, and beyond. Aside from Technical Talks, it was great to also hear talks such as "What the future holds for mHealth", and to hear from the Marketing Department of Samsung Europe. After the event, we had a Networking Party, and music from Roo Panes. The day was well organised, and I look forward to the next one, by which time I should be well on-board with Samsung Apps and Android Development. A long day for me, 19 hours in total, and back to Macclesfield within the day!